Traveling to another country is both exciting and daunting. But it doesn't have to be if you are prepared! Ecuador is a mega-diverse country with four different regions that differ greatly from one another. Together in one place you can find yourself in the Amazon, Andes, Pacific Coast, or the Galapagos Islands. 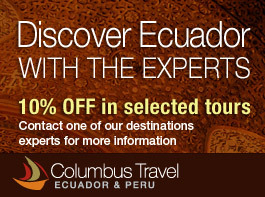 Columbus Travel wants you to have an amazing experience during your Ecuador Tour. So take a look at the great summary of everything you should be prepared for, as well as advice and safety tips for traveling in Ecuador! It is always best to prepare things at home for when you'll be away. Check-Ups. It's a good idea to have all your prescriptions filled and find out what kind of insurance coverage you have when traveling abroad. Depending on where you go, it may also be wise to consult your doctor to see if you need any supplements or preventative shots. Passport Copies. Leave a copy behind with someone you trust and think about sending an electronic copy for easy access in your email while you are traveling. Always better to play things on the safe side. Also, it's good to have a few copies stored separately for when you are traveling abroad. The Game Plan. Leave behind your travel plans and contact info with friends and family back home. This way, if they need to get a hold of you they know how to contact you and where you will be traveling. Register with your Embassy. If anything should happen while abroad, the embassy will know how to contact you and your family. Register at home with your embassy before you step foot outside the homeland. Locate your Embassy. Another good idea is to know the location and contact information for your country's Embassy, should you need to contact them in case of an emergency. That is always the first place you should go when you run into any problems if you are on your own. Confirm. And Re-confirm. Nothing is worse than planning your trip and misunderstanding the slightest detail which can totally derail your entire vacation. 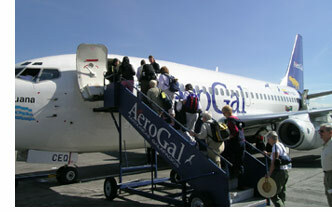 For all your flights and tours, it never hurts to reconfirm anything you are unsure of before you leave. Any travel agent will understand your concern and wants to do their best to arrange everything perfectly for you, so don't be shy. Keep an open mind. If this is your first time visiting another country, keeping an open mind is very important. Be respectful of the different cultures you will meet and understand that what you may be used to back home is completely different in other places around the world. Brush Up. On your Spanish that is. Ecuador's spoken language is Spanish and knowing a few basic things to help you get around can't hurt. Things that are helpful are knowing how to ask for a bathroom, basic ordering skills in restaurants, and how to ask for directions - especially knowing left from right! Converting your money isn't a problem for those from the US anymore since in Ecuador they've switched over to the US Dollar. But if you are coming here with a different currency, think about changing your money before coming. It's the safest and most secure way to do so. To help you keep your money safe, we've provided some tips that will come in handy before and when you arrive. Traveler's Checks. Don't put all your confidence into traveler's checks anymore. They are not widely used and there is a slim chance you will find a bank or hotel that will accept them. ATMs. If you are looking for an ATM you won't have any problems finding one, especially in the larger towns and cities. In case you find yourself looking for one you can simply ask, "Donde hay un cajero automático?" Ecuadorians are friendly people and they will usually point you in the right direction. The safest ATMs are those found inside malls or banks. If you use one on the street just make sure to keep an eye out, and try to use one that is well lit if it is late. It's always best to be accompanied by someone else you trust or with your group. Don't walk away from the ATM with cash still in your hands; put it in a safe place. Using common sense and being tourist smart goes a long way. Denominations. Here in Ecuador, $1 goes a long way. Many small 'tiendas' or stores along the street and even in the malls may not accept anything larger than a $10 bill because it is too much to break. Carry with you smaller denominations. Many of the smaller stores will also not accept credit cards. Most restaurants and bigger, commercial stores do, but only if the amount is above at least $5. A good rule of thumb wherever you go is to not use a bill 50% larger than your tab. Otherwise, you could be waiting to pay while they go run next door asking their neighbors to help break change or you may not be able to purchase what you wanted. Credit Cards. Most major credit cards are accepted in Ecuador such as MasterCard, American Express, and Visa. Smaller hotels may not accept cards but almost all travel agencies, major hotels, and restaurants do. Banks. Banks are the best place to exchange your money if you come up short or haven't switched currencies yet. It is much safer than in the airports or heavily populated tourist-y areas, plus you'll have zero chance of being ripped off which is a win/win situation for everyone. Most banks in Ecuador are open 9AM till 4PM. Saturdays some banks may be open, but only in the malls and only half the day. Keeping Your Money Safe. If you are walking around unfamiliar places, it is really important to keep your money safe. Try not to carry every dollar you saved for Ecuador on you. It's better to take what you need and keep the rest in your account or in a safety box in a place you trust, just in case. The best place to keep your cash is in your front pocket, not in the back. That's an easy target for street thieves who pick pockets. If you are keeping your money in a purse or a backpack, always have a hand over your purse if you wear it with a strap to the side, even better if you can keep it to the front. If it is a handheld purse or wallet, its best to hold it in your hand close to your body, near your chest keeping it guarded when you walk. If you are using a backpack, wear it in front of you on your chest if you can. Ecuador is not a dangerous place if you are street smart. Using these tactics will keep thieves from grabbing your wallet or purse from behind, or trying to take things out of your backpack. One last tip, avoid walking alone if you can. Traveling in a group is always the safest decision. We'll talk more about this in the Personal Safety Section. If you are thinking about doing some exploring on your own before or after your tour begins it is very important to know how the transportation system of Ecuador works. Make sure to read the following information. Make sure the taxi is completely yellow. Do not accept a ride from anyone else in a differently marked car. Some executive taxis are not yellow and are only by made my calling for a pick-up, but do not accept one on the street. The taxi must have all the following criteria; license plate in front and back, a green taxi license number posted in the upper windshield and side of car on the door make sure these are the same and they shouldn’t be any other color than green. Never use an unmarked taxi. Before getting inside it is a good idea to ask if the driver if he can take you to the place you want to go, sometimes they will say no because they aren’t going in that direction. When you are finally in the taxi, ask the driver if he will use the taximeter. In Spanish this is called the “Taxi-metro”. You can say, “Tiene el taximetro funcionando?” If they say no, get a different taxi. Ecuador is known for its location on the Equatorial Line, so it's probably okay to assume to pack all your shorts, tanks, and flip flops right? You might want to rethink that! Ecuador typically has two seasons, rainy and dry. When these dry or wet months come, they vary greatly on where you are in the country. For your packing list regarding clothes it is always best to be prepared. For the most part, if you plan on spending your time in the Andes we recommend an assortment of pants, shorts, t-shirts, long-sleeved shirts, a few sweaters or sweatshirts, and a versatile jacket. For added warmth for some higher elevations a scarf, hat, and gloves or mittens will come in useful since it can become pretty windy, even in Quito. We don't recommend flip-flops if you will be doing lots of walking or visiting popular Andean sites. Hiking boots or sneakers are a better suggestion. Save the flip-flops for the hotel, beach, or poolside. Andes: Generally speaking, the Andes are known for having sweater weather. The wetter season ranges between December to May where you can expect rain almost daily in the afternoon. From June to September the days are clear and sunny, apart from a few cloudy days here and there. But, don't let that deceive you. The Andes are very high in altitude and when the sun goes down it gets quite chilly. The same goes for early morning. It's always a good idea to have a light jacket or sweater because you never quite know how each day will pan out. October to November has periodic showers here and there. During this period it is hard to tell how the weather will be, so like we mentioned, it's best to be prepared just in case. Coastal Ecuador: A few of our tours involve visits to the Coast such as Guayaquil. On the Pacific Coast of Ecuador you will find a very different climate from the neighboring Andes. The weather is quite humid and hot. The rainy season is usually between January to May and the dry season is roughly June to December. It is always exciting to try different types of gastronomies when you visit new countries. Although, your stomach may not be too excited after being so used to home cooked food and then all of a sudden thrown into a whirlwind of different cuisines. In the first few days take it easy with baby steps when trying new foods. Make sure to bring different remedies with you for things like heartburn or upset stomach. It will be good to have handy instead of running around trying to find a drugstore and then having to explain to the pharmacist what's going on. But if you are absolutely dying to try that new, exotic dish, don't take an order off a street joint. Try a restaurant where you can sit down and enjoy the meal and be sure your food was well prepared. What's more, in most restaurants you can find international dishes like spaghetti, salads, steaks, burgers, chicken, and other meals you might be more used to if you are not feeling so adventurous in trying out the Ecuadorian food scene. Regarding the safety of water it's certainly nothing to be afraid of, but there is no harm in playing it on the safe side. When you order water in a restaurant they will usually give it to you bottled anyways. They will also ask "sin gas" or "con gas" which means carbonated water or non-carbonated water. You can never be too safe and that's why we are providing you information that could help you in a sticky situation. For any type of emergency simply dial 911. This can be done from any cellphone, landline, or payphone. If you are with your tour guide or group leader, always keep him/her updated on how you're feeling and regarding any situations you've found yourself in. If you happen to be alone use good preventative measures like those listed in Personal Safety. If something like a robbery should happen, keep calm and don't resist. Your wellness is much more important than any materialistic belongings you have. Afterwards, keep calm, find a secure place and call the police and file a report with your Embassy. No matter where you go in the world, it pays to be both street smart and use good common sense. But, not everyone has the same amount of travel experience and not everyone is equipped with super human powers to ward off thieves and/or any other unpleasant experiences. If you follow the tips we've provided below you'll be on your way to a much safer trip with a peaceful state of mind. Keep wallets, purses, cell phones, and money on you and close to you. It's also a good idea not to carry large sums of cash on you at once. Make sure you read our section about Taxis. Don't get into any unmarked cars and make sure the taximeter or "taximetro" is on and working. Get another cab if it isn't. Try to travel in a pair or in a group. There is always safety in numbers. Be aware of your surroundings. If you like to use headphones, don't put the volume up so high so you can hear what's going on around you for example. Walk or ride bike facing the traffic. It's much safer to see what's coming toward you instead of having your back to it. Send a physical message that you know where you are going, where you are, and that you are confident and calm. Never accept a ride from a stranger or hitch-hike. But we bet you were probably told that when you were a kid!